Gulf States Taking Heat For Not Resettling Syrian Refugees : Parallels Humanitarian groups are criticizing the wealthy Gulf Arab states, which do not have a tradition of resettling migrants. Analysts say there's little political will to change that. 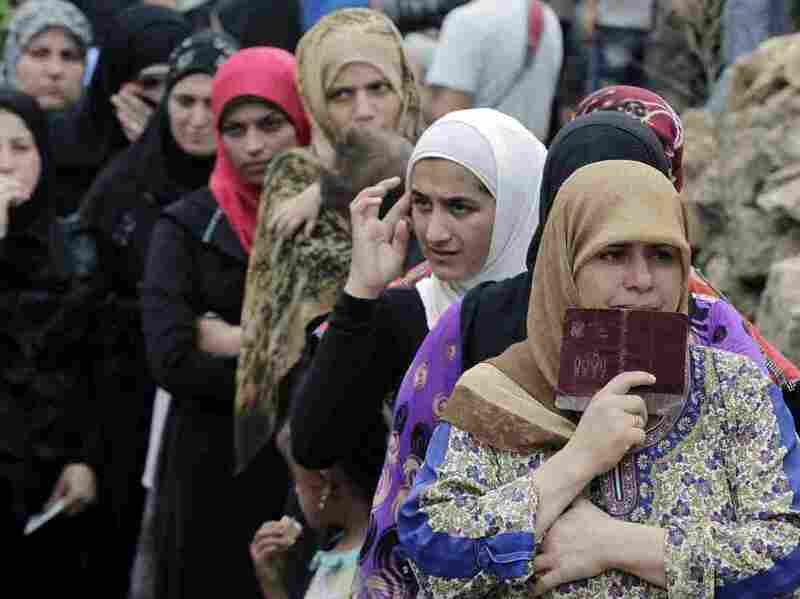 Syrian women wait to receive aid at a refugee camp in the Lebanese town of Ketermaya. 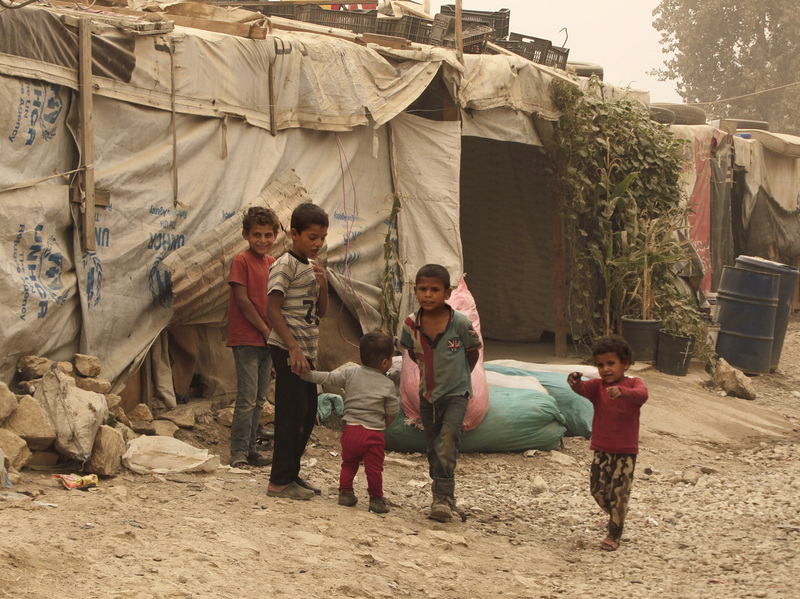 Lebanon has taken in 1.1 million Syrian refugees. The U.N. refugee agency says Arab Gulf states have taken none. For Syrian refugees, trying to find safety and building a new life in the one of the wealthy Arab Gulf states would seem logical: no harrowing sea journeys, and a familiar language, religion and culture. Human rights groups and others are urging these countries to do more to welcome Syrian refugees. The U.N. refugee agency and Amnesty International say that none of the Arab Gulf states — including Saudi Arabia, Kuwait, and the United Arab Emirates — have settled Syrians looking to escape the war. "The Gulf states have traditionally not been resettlement countries," says Bill Frelick, the refugee program director at Human Rights Watch. "They've been sort of aloof from doing that. That doesn't mean they shouldn't take on this responsibility. This is a responsibility that should be shared by all countries." Syrian refugees stand outside their tents during a sandstorm in a refugee camp in the town of Bar Elias, in Lebanon's Bekaa Valley. Adel al-Jubeir, Saudi Arabia's foreign minister, says his country already has a good track record for helping Syrians. "The kingdom of Saudi Arabia is one of the largest supporters of aid to the Syrian refugees, whether in Jordan or Lebanon and other places," he says. "And the Kingdom of Saudi Arabia has been a welcoming environment for Syrians." The Gulf states don't have systems in place specifically for refugees, Frelick says, but do receive Syrian workers. "There's a de facto refugee system that works through migrant workers who get work visas and maybe are actually fleeing persecution and conflict, but are not recognized as such and are not protected as such," he explains. "They are there basically under the rubric of being a migrant worker." Hundreds of thousands of those Syrians are already living in Saudi Arabia, Kuwait and other Gulf states on work visas, says Daryl Grisgraber of Refugees International. "Some of the Syrians who were already in the Gulf countries before the conflict and who got stuck there during the conflict have been allowed to extend their stays in some cases," she says. Grisgraber says there are security concerns among Gulf nations — as well as fears that a flood of Syrians escaping war will destabilize the Arab nations and that newcomers will take all the jobs. There is simply no political will, Grisgraber says, to bring Syrian migrants in. "The Gulf countries, there's always been a bit of a nationalist bent, I think, a bit of a reluctance to have too many foreigners in there," she says. "But in this case, it seems misguided not to be offering some protection space to these refugees." There is now increasing pressure on the Gulf states from humanitarian agencies and other governments to take in Syrian refugees, Grisgraber says. Saudi Foreign Minister Jubeir, speaking at a press conference, called the situation in Syria a tragedy. He offered concern for the refugees — but no plan to resettle them. "We continue to care about Syria and the Syrian people," he said. "We have many, many Saudis who are of Syrian descent or who have relatives in Syria. So this is an issue that we attach great importance to." But people across the Arab world, using social media, are starting to demand action. The hashtags criticize Gulf leaders for not taking in Syrian refugees. Many show drawings or photos of Aylan Kurdi, the 3-year-old boy who washed up last week on a Turkish beach.